As the dark nights close in and the weather gets wintery, I yearn for comfort food. Asda was kind enough to send me one of their new extra tasty roast in a bag chicken to try the other day but, even if I have a friend over for supper, a roast chicken leaves me with lots of leftovers. 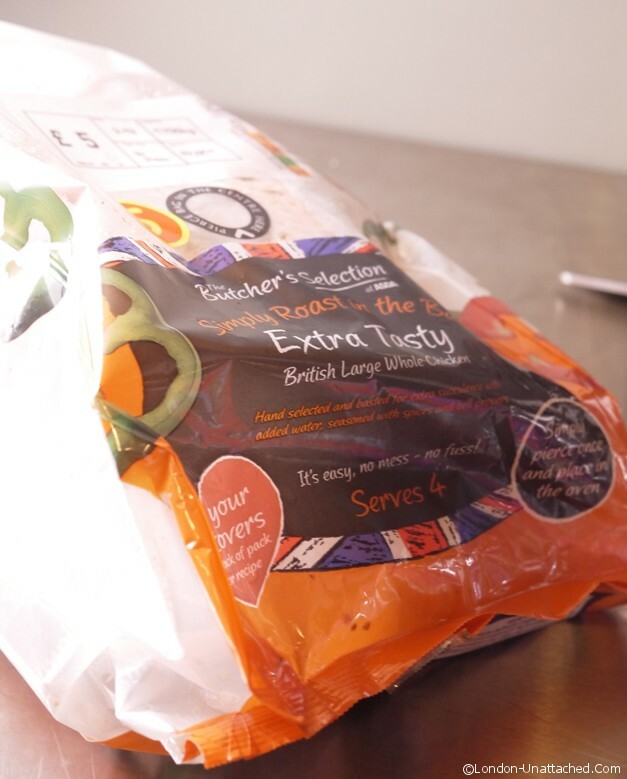 The Asda Extra Tasty Chicken comes pre-packed in a roasting bag that you pierce and then put in the oven – so there’s no chance of any mess. And, for me, less temptation to make roast potatoes (not very 5:2 diet friendly). The wrapper told me that it was ‘basted’ with various spices and flavour. The result was a very moist chicken (9% water) not unlike the ‘brined’ poultry and ham that our friends in the US are so fond of. Brining is a process of leaving meat in a heavy solution of salt and flavouring for 24 hours so that the liquid permeates the skin or fat and the end result is flavoured and moist. You can do it at home (Nigella is a big fan of brined turkey) but it’s rather messy and quite time-consuming. However the roast in the bag chicken was created in the Asda kitchen, the result was good. While the skin didn’t crisp up as well as I might have liked, it would be quite easy to open the bag for the last 20 minutes or so of cooking. And the meat was beautifully flavoured and very moist. Would I buy it again? Yes, if I was staying with a friend or on holiday and wanted to keep their oven pristine, or if I knew I didn’t want any kind of roast vegetables or yes if I didn’t want to have to think about how to flavour the chicken myself. It’s excellent value, very easy to cook and the result is definitely tasty. But it’s not organic or free range – although at £5 for a large chicken that would be remarkable. 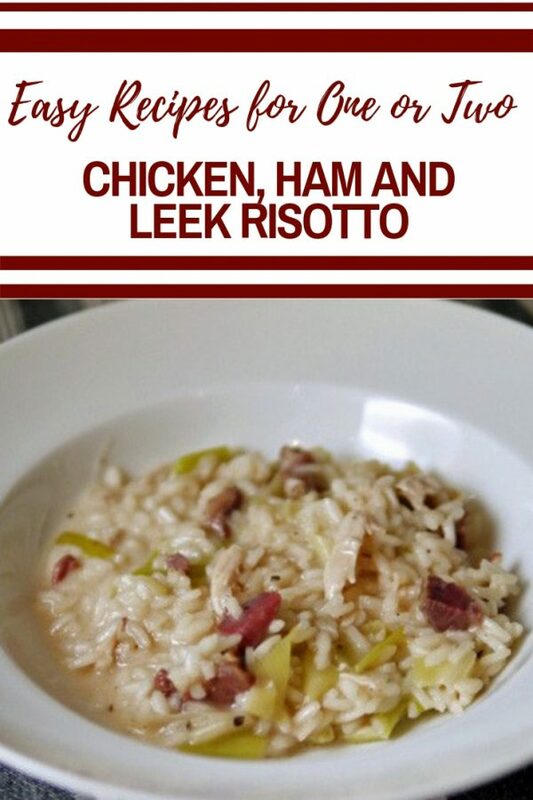 After our roast dinner, there were plenty of leftovers, so I boiled up the bones of the chicken to make stock and used half to make a delicious and warming chicken, ham and leek risotto. I have a feeling I was supposed to follow the recipe printed on the underneath of the roasting bag, but since I threw that away when I served the roast dinner, I failed to do anything more than notice it was a recipe for some kind of risotto. And, I do know how to make risotto – my way. Almost certainly the kind of Italian cookery that would have the entire female population of Italy in revolt, it’s my ultimate comfort food. 1 Chicken Carcass <g class="gr_ gr_192 gr-alert gr_spell gr_inline_cards gr_run_anim ContextualSpelling ins-del" id="192" data-gr-id="192">left over</g> bones from your roast chicken. If you don't have a chicken carcass or fresh stock available, then use a VERY good quality stock powder. Put your chicken carcass in a large pot, cover with cold water, bring to the boil and simmer gently for 2-3 hours, topping up with more water as required. If you like you can add in a carrot, stick of celery, onion cut into quarters and a bouquet garni of fresh herbs. But, to be honest, I don't usually bother. Once the bones are falling apart and the mixture has reduced down and become cloudy, remove from the heat and allow to cool. Pick any meat from the bones and add back into the stock. For risotto for 2 people you will need about 500 ml of stock. Any <g class="gr_ gr_193 gr-alert gr_spell gr_inline_cards gr_run_anim ContextualSpelling ins-del" id="193" data-gr-id="193">left over</g> can be used for soups or stews or frozen for use at a later date. Melt the butter over a low heat in a heavy based pan. Add in the chopped shallot and soften for 2-3 minutes. Then stir in the rice and coat all over till it goes translucent. Pour in the wine and keep stirring till it is all absorbed. Meanwhile, heat up your stock (I generally do this in the microwave!). Add it into the rice bit by bit, adding just enough to cover the rice by a finger's thickness each time. Keep stirring! When you've added in around a third of the stock, add the leeks to the mixture and continue to add stock and cook. Finally, just before you've added in all the stock add the chicken and ham. Add in the last of the stock, keep stirring until it is all absorbed, then take off the heat, stir through the parmesan and creme fraiche, cover and leave to one side for 5 minutes. Taste and season with salt and pepper as required. I have a few simple rules that I’ve picked up from various sources and follow when I am making a risotto. I DO use homemade stock. I’ve tried with stock cubes of various sorts and with stock powders but never get the same result. For me, e-Cuisine is about the best stock powder for flavour but lacks the gelatinous quality of a homemade fresh stock. So – no fresh stock, no risotto! Good risotto rice is essential – not long grain. I probably don’t stir quite as much as I should. But I do stir throughout the cooking process to release the starches from the rice. My risotto is always made on the stove top. I’ve tried an oven baked recipe and it simply isn’t the same. Depending on the main ingredients I add parmesan, creme fraiche or cream and salt and pepper at the end. I always let the risotto sit for 5 minutes once the rice is just cooked. Other than that, making risotto is something where I let my imagination determine the flavours. I added in a little ham this time to complement the leeks. 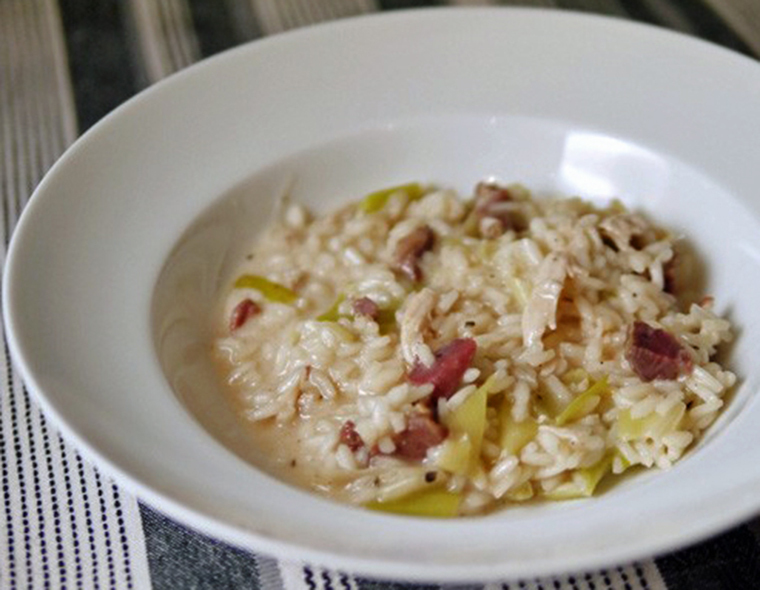 Risotto is a lovely simple supper dish that has more substance than a homemade soup but doesn’t actually cost much more. All in, a medium to large roast chicken should stretch to main meals for a family of four on two nights if you use the bones for stock and make something like risotto. And, if you are lucky there will be enough stock left to make a hearty winter soup too. Not bad for a fiver. Disclaimer: I was provided with an Extra Tasty chicken by Asda. All views expressed are my own. Looking for comfort food? Why not try my low-calorie celeriac soup – it’s delicious! This sounds delicious! I always try to use up my leftovers these days to save money so will bookmark this leftover recipe thanks! Well, it’s always great to have a risotto. Good also to keep your rules in mind. LOL…well you could add sausages for the partner!